A guide to server creation. Note: I did this instead of posting yet anouther help topic on making servers through this I hope there can be a comprehensive guide made for the wiki or used as a sticky on the forum you have a few choices when you wish to play with your pals across the information highway one is setting it up through port forwarding or through a service like remobo or hamachi. 2.a If any firewalls are present, they must allow the port to pass traffic as well. 3. Let your friends know what your internet IP is (you can find this by looking at your router's status page or go to a site such as whatismyip.com). also if it isn't apparent you also need to find the IP for your router so that you may gain access by typing the IP into the address box of your browser. finding these internal LAN IP's in Window's can be as simple as typing ipconfig into the command prompt. RabbiBob wrote: More specific to Linux[/unix-like] and perhaps useful, I found that by running the server with nohup I can exit the ssh session in order to leave the server running. I can also ssh in remotely when I'm not at home to start it up again if needed. I've been curious as to how others have their servers running. (06:14:26 PM) Menche: should we "officially" recommend remobo somewhere for casual multiplayer? (06:16:07 PM) marktraceur: We shouldn't recommend any non-free software. (06:16:20 PM) Menche: ok, then what? (06:17:40 PM) Menche: and is hamachi free? (06:19:19 PM) Menche: wouldn't that still require port-forwarding on the server? (06:20:34 PM) marktraceur: It would be stupid of this community to endorse non-free software. Learn to port forward instead. Okay, now that thats out of the way and I have forced you to read through that lets actually start shall we? Step 3: now that you and your friend have done that you can add each other as buddies by one of you adding the other into his contacts. Step 4: the person who is planning to access the others said minetest server must now hover over his friends computer and type the little address that appears into the multiplayer address box. Step 5: connect with the port your friend has specified for the minetest server and ENJOY! Last edited by sdzen on Sat Feb 09, 2013 01:25, edited 1 time in total. Thanks. I agree as the question has come up a few times since I've joined here and it would do well as a sticky topic for beginners. 3.a. If any firewalls are present, they must allow the port to pass traffic as well. More specific to Linux and perhaps useful, I found that by running the server with nohup I can exit the ssh session in order to leave the server running. I can also ssh in remotely when I'm not at home to start it up again if needed. Last edited by RabbiBob on Sun Dec 02, 2012 13:08, edited 1 time in total. You do know I am running Windows XP SP3, and it ran fine as a client (the server was the client) with Bwog right. Last edited by Jordach on Thu Feb 16, 2012 12:45, edited 1 time in total. CalumMc wrote: Lots of people also have dynamic IPs, so using some dynamic DNS provider would be good, like I do with my server. Even setting a static internal IP would be good. Dynamic DNS is a good idea. 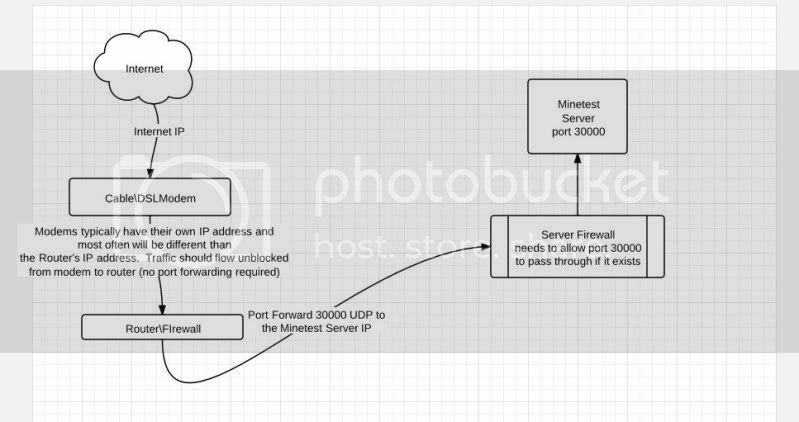 True: If you didn't have a static internal IP, your port forwarding would fail if the IP ever changed. I've been so used to static ip'ing my Internet bound servers that I didn't think of that. This is really convoluted. Just use screen or tmux. Care to explain? I need to be able to shutdown, backup, and start the server from a cronjob and I've been able to do it with nohup without issue. RabbiBob wrote: Care to explain? I need to be able to shutdown, backup, and start the server from a cronjob and I've been able to do it with nohup without issue. When screen is called, it creates a single window with a shell in it (or the specified command) and then gets out of your way so that you can use the program as you normally would. Then, at any time, you can create new (full-screen) windows with other programs in them (including more shells), kill the current window, view a list of the active windows, turn output logging on and off, copy text between windows, view the scrollback history, switch between windows, etc. All windows run their programs completely independent of each other. Programs continue to run when their window is currently not visible and even when the whole screen session is detached from the user's terminal. You'll see an informational page, hit return. Then you will see your shell prompt, but you're now actually inside screen. Now you can detach from screen by pressing CTRL-a then the d key. More specific to Linux and perhaps useful, I found that by running the server with nohup I can exit the ssh session in order to leave the server running. There's a little linux http server named thttpd, and one of the scripts included in the distribution is a simple shell script that runs thttpd in a loop, meaning after it starts the server it checks the proccess list for the existance of the proccess number, and restarts the server if perchance the proccess number doesn't appear in the proccess list. sfan, I moved my posts into its own thread. I mean no disrespect, but I believe the actual assumption is that you're smart enough to use Google to find instructions for port forwarding. Like Sfan5 said, it's different for each router. The simple explanation is "Use port forwarding"
Server creation between 0.3.1 and 0.4 is pretty much the same, except for the world/gameid stuff. Never download a random .bat file from the Internet (or if you do so, always, always check its contents). Do it yourself. minetest.conf is a text file, open it in a text editor like notepad/textedit/vim/gedit. qui pourrait m'expliquer en français comment on crée un serveur ? No, I assumed that I was trying to get a helpful track out there and that I'd help whoever else had specific questions and add to the information at hand.